With antibiotic resistance rendering many drugs useless, scientists are developing new ways to fight deadly infections. The era of antibiotics that began almost a century ago is coming to an end. Diseases that were once easily treatable have become resistant to even the most potent antibiotics. Pharmaceutical companies keep rolling out new antibiotics, often to great fanfare. But experts say such innovations won’t stop the potential disaster barreling our way. For one thing, bacteria become resistant to every new antibiotic, typically within a few years. And mounting evidence shows that antibiotics themselves can harm us. They wipe out good as well as bad germs, promoting everything from secondary infections to obesity. Riley’s candidate for the next generation of wonder drugs is a class of proteins called bacteriocins. Chemically and functionally, these naturally occurring compounds are worlds apart from today’s treatments. Antibiotics are microbial carpet bombs, wiping out swaths of beneficial bacteria alongside the ones we're trying to kill. Bacteriocins are more like guided missiles. They can be tweaked to target a single species, or even one strain of a species — E. coli bacteria, for instance. E. coli is of special interest to Riley because it causes 90 percent of urinary tract infections (UTIs), a leading reason for antibiotic prescriptions. Antibiotics are rapidly losing their power against UTIs, so Riley is encouraging the Department of Defense to develop a bacteriocin-laced wipe for female soldiers. Applied once a day, the wipe would mow down UTI-causing bacteria without disrupting other germs on the body. For such use, it could be approved following military protocols. That would help establish the safety and efficacy of bacteriocins, paving the way for the more costly and time-consuming clinical trials needed to secure FDA approval for bacteriocin-based pharmaceuticals. From there, Riley wants to develop bacteriocins against key antibiotic-resistant illnesses. “We’re targeting tuberculosis now,” she says. “I have 10 students working on an anti-TB bacteriocin spray to test in mice.” Her team is also going after the resistant lung bacteria that infect cystic fibrosis patients. Another early target for bacteriocins is livestock. Eighty percent of antibiotic use in the U.S. occurs on farms, which are a devastatingly efficient breeding ground for resistance. Maine-based ImmuCell Corporation is developing a bactriocin-based drug for bovine mastitis, a common ailment in cows, and Riley is working on bacteriocin sprays that could replace antibiotics for controlling respiratory disease in chickens. Riley envisions a new era in which antibiotic use is restricted to emergency rooms, where doctors often need to kill a broad swath of possible pathogens as quickly as possible. In other medical settings, patients battling infections would be given bacteriocins instead. Because bacteriocins are so targeted, they work in low doses and can be used in combination. That one-two punch all but eliminates the ability of harmful bacteria to develop defenses against them. “Resistance to bacteriocins is effectively not going to be an issue over human lifetimes,” Riley says. Bacteriocins aren’t the only promising option for the post-antibiotic era. After a long career in microbiology, 80-year-old Carl Merrill recently came out of retirement to pursue another germ-killing weapon: a family of germ-killing viruses known as bacteriophages. 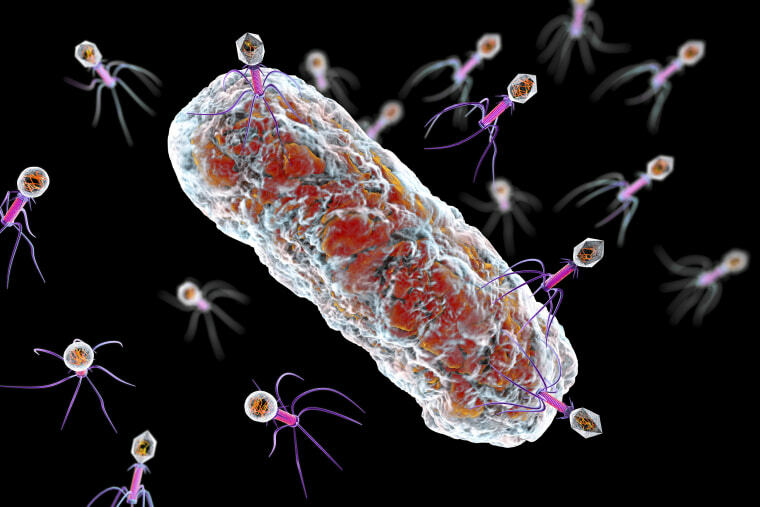 If bacteriocins are guided missiles, phages are literally germ warfare: pathogens that evolved to kill other pathogens. Like bacteriocins, phages attack just one type of bacterium while ignoring others (and human cells, too). Unlike bacteriocins, phages are capable of replicating. In effect, they’re a self-generating treatment. That introduces new risks, but also huge potential benefits. “I think this is going to revolutionize infectious disease medicine,” Merrill says. Phage therapy has actually been around for nearly a century but has been held back by safety concerns, the difficulty of finding the right virus for each infection, and the ability of bacteria to evolve their own defenses. Merrill thinks he’s licked these problems. His startup, Adaptive Phage Therapeutics, is working with the U.S. Navy to assemble the world’s largest library of phages, organized by the bacteria they attack. Drawing on the collection, doctors could assemble a phage “cocktail” that attacks a bacterial illness in multiple ways, killing it before it has a chance to develop resistance. The work just paid off in dramatic fashion last March, when phages from the library were used to save the life of Tom Patterson, a 69-year-old doctor infected with an antibiotic-resistant bacterium called Acinetobacter (also known as Iraqibacter because it has sickened so many troops in Iraq). Patterson was lying comatose in a San Diego hospital but woke up after being given an experimental phage cocktail. A second cocktail finished off the infection. He left the hospital in August thin but recovering, the first patient in the U.S. to be healed this way. To Merrill, the Patterson case illustrates how medicine will not only manage but thrive in the post-antibiotic era. In the future, he anticipates doctors will examine the genetic fingerprint of the germ causing a patient’s infection and transmit that information to a phage library. There, software will instantly match it to the right set of killer viruses and ship back a customized treatment. “Bacterial viruses will eventually replace antibiotics,” he says. Riley has a similar vision for bacteriocins. “Give me a month, a couple thousand dollars, and a few undergraduates, and I can find a bacteriocin to kill any pathogen you’re interested in,” she says. Once the first of these targeted drugs passes through clinical trials, many more could follow rapidly. They might be augmented by other still-experimental therapies, such as “quorum sensing” drugs that neutralize bacteria’s ability to coordinate their attack in the body.